We should let the Bush taxes cuts expire next year. I’m not willing to go a long way down the tax route. I think restoring the Clinton tax rates makes sense for a number of reasons. a. If we do nothing it happens by just letting the Bush cuts simply expire in 2013. 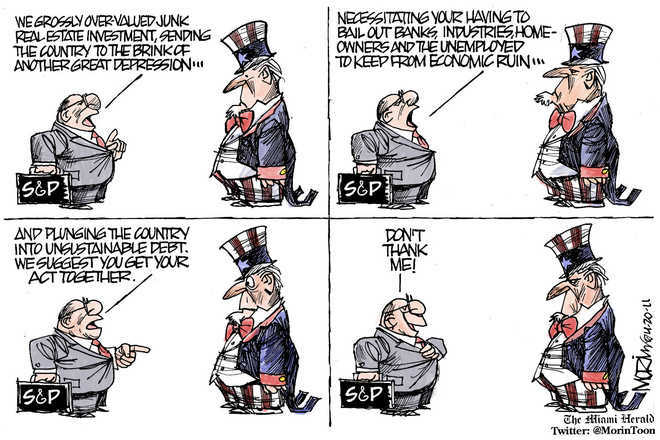 Unfortunately, I don’t think either party will go down that route as they appeal to voters in 2012.
b. These rates have been in place in the recent past, and I think we can be fairly confident they won’t have huge adverse impacts on work, savings and investments. If we go further (in raising taxes), carefully prepared studies will be made of their impacts by economists, and those studies will show results ranging from armageddon to an improved economy. A better argument can be made to go back to Clinton rates just based on we had them 12 years ago and the world didn’t end. c. a rate increase across the board doesn’t get into question about making one group pay the deficit down. Everyone gets hit up. d. A raise taxes approach would require really hefty increase, especially if on the well to do only. I’d say like doubling the effective tax rates (the portion of their income that goes to taxes.). Different people will disagree, but in my view it reasonable to more than concerned about the effect on the economy, it wouldn’t be fair to hit one group (even the fat cats) that hard. e. I think we can find expenditure reductions. Spending has boomed in the Obama years. I very much liked the suggested point-counterpoint opinion pieces on the front of the Outlook section in today’s Washington Post. Actually it was not so much a debate with pro-one side vs. the other arguments, but rather a one-two-punch critique of the rhetoric used on both sides. Once democracy is established and consolidated, common sense is rarely a match for the messy and complicated business of governing. No matter how many times politicians invoke the term today, there can be no such thing as a single, simple, common-sensical solution to the problems confronting the nation. The mind-boggling complexity of the issues surrounding climate change, economic recovery, multiple wars and, yes, federal and state budget deficits outstrips the authority of common sense either as the basis of workable policies or as a critique of those already on the table. The divisions in American public opinion also pose a challenge to “common sense” rhetoric. The federal budget and the family budget are decidedly different beasts. Once we get past the level of real common sense — as in “don’t put your hand in the fire if you don’t want to get burned” — one person’s common sense is generally another’s misguided thinking. 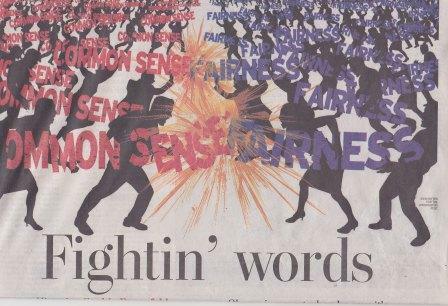 The political appeal to common sense is thus best understood not as a call for clearheaded solutions but rather as a form of pandering — an effort by pundits and politicians to channel real popular anger and to lather voters with collective flattery. Calls for common sense like Beck’s or Palin’s start from the premise that the hard-working majority can instinctively tell right from wrong. That their enemies — self-serving Washington politicians, greedy Wall Street bankers, immoral Hollywood entertainers, out-of-touch scientists and “experts” — cannot be trusted. (After all, these are the elites who got us into the mess we’re in.) And that it’s time for the rest of us in the majority to “unite” and apply our “innate common sense,” in the words of Beck, to the real issues confronting the world. If opportunity in America is a sham — if the system is rigged and some people get the breaks only for reasons of luck, birth, or discrimination — then merit is fictitious and redistribution brings greater fairness. But if America is an opportunity society — if you have the chance to work harder, get more education and innovate — then rewarding merit is fair, and it is fair for some to make more money than others. But right now we’re far from achieving “common good” and “shared sacrifice” solutions, because our politicians are too busy hiding behind these words of “common sense” and “fairness” in accusing the other side of being unreasonable. Fundamentally, the gulf between the two political parties in their views on the appropriate roles of government (and hence the best way to reduce the deficit) seems enormous right now. The quality of the conversation is going to have to improve before the necessary compromises on policy materialize.